It seems incredible to me but I find that I have already been writing these missives for over a year. Inevitably, I come back to themes of dinners and exhibitions and museums I have been to. It is all part of being an art dealer or probably anyone who leads a professional life. We go to fairs and exhibitions in the places we frequent and we attend functions of interest both personally and professionally. So it is with the Private Art Dealers Association of America known as PADA. Every year it gives a dinner in honor of an institution or one of its departments that do work in the areas that interest our members. Winners of the PADA Grant in the last few years have been The Master Drawings Association, The Frick Art Reference Library, The International Foundation for Art Research and the Concerts & Lectures Department of The Metropolitan Museum of Art. This year it was the Hispanic Society of America. A gem of a museum which has the misfortune of being on 155th Street on the west side of Manhattan. A friend of mine once said to me that in New York City we live in a 20 block (approximately 1 mile) radius of our homes. It sounds ridiculous but it is true. This, of course, does not include working in another location which I guess would add another 20 block radius. Think about it, New Yorkers, it is an amazingly accurate generalization. It is actually not that difficult to get to the Hispanic Society by taking one of the West Side subway lines but few of us make the effort. Unfortunately, I must also plead guilty to that charge. I have been there less than a handful of times in my life. This city is rich in its cultural institutions but if they are not on the beaten track their number of visitors are always a small percentage of the institutions on Manhattan’s East Side from 34th to 91st streets. The Hispanic Society is located on Audubon Terrace a landmark district consisting of eight early 20th century Beaux Arts Buildings with several cultural institutions. From the Society’s website it “is a museum of Spanish, Portuguese, and Latin American art and artifacts, as well as a rare books and manuscripts research library”. If that doesn’t race your motor how about the fact that you can also view great paintings by the most famous Spanish Masters such as Velazsquez, Goya and El Greco! If you are watching your budget it does not hurt that there is no admission fee. Of course, you also have the bragging rights since fewer visitors to New York go there as opposed to the other museum in town. The PADA dinner is given at the Lotos Club, situated in a mansion built for the daughter of William H. Vanderbilt in 1900. We had cocktails and hors d’oeuvres in the period library with its portraits and large fireplace and then there was a dinner for 64 in the banquet room. The presentation of the grant was made by PADA’s President, Robert Dance and accepted for the museum by its Director, Mitchell A. Codding. Robert Dance spoke of his early visits to the Museum when his mother took him and his enjoyment of what seemed to a child as a slightly spooky atmosphere with its narrow staircase up to a balcony filled with objects. In the recent renovation these walls are now devoted to paintings. 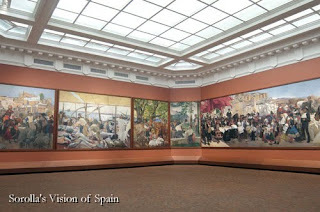 Mitchell Codding spoke of the renovation of the museum making it more accessible and the restoration of the 14 huge paintings by the Spanish artist Joaquin Sorolla y Bastida (1863-1923) known as the “Vision of Spain” illustrating the regions and people of his homeland. Sorolla received the commission from the founder of the Museum Archer Milton Huntington in 1911. Sorolla then travelled all over Spain making sketches and finally completed the commission in 1919. But the paintings were only installed at the museum in 1926. The artist had died three years earlier. It took until the 21st century for this important cycle of pictures to make it’s pilgrimage through Spain in an exhibition that attracted more than two million visitors. Before they left their home they were first cleaned, their first bath in close to a century. The museum took advantage of their absence to do a major renovation of the gallery where the Sorrollas were installed 85 years ago with a new roof, skylights and lighting as well as a reinstallation of the surrounding galleries. Robert Dance is retiring as President at the end of this year and the evening ended with an impromptu toast from a fellow founder of PADA, Jill Newhouse. She praised Robert’s inspiration and leadership over the many years he has served as President during two separate terms in office.